Painting Exhibition by B A Reddy is an event that took place between 09-Dec-2006 and 18-Dec-2006 in Hyderabad. He stopped participating in competitive exhibitions since 1985. There was nothing left to win. His students still don't give the others a chance. Alankritha Art Gallery is organising Harmony - Ethnic Allure, an exhibition of paintings by Dr B A Reddy, from 9th to 18th December. A total of 27 colorful paintings are on display. This collection by Dr Reddy is based on the traditional customs and practices of Andhra Pradesh, particularly highlighting the Telangana region. He has given all of his paintings traditional Telugu names, like Bonalu for one with beautifully attired women carrying pots of rice for offering the Grama Devata during the Mahankali jatara. Then, there are Bathkamma where women of Telangana celebrate before Dussehra, Kolatam the traditional dance, Potaraju during the Mahankali Jatara, Sankranti and Dasari during Pongal festivities, and three paintings of Talavinyasam where a man plays a mridangam. 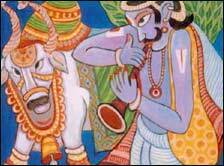 Pamulavadu, Swayamkrushi, Gudi Gantalu and Kallugeeta are other paintings on show. Born in the family of peasants in 1940 at Pamarru, Krishna District, Dr Reddy obtained a Diploma in Fine Arts from the Government of A P, and graduated in English literature from Agra University. He worked as an art teacher from 1958 to 2000 in several state and central government schools. He received an honorary doctorate in the year 2005 from the Potti Sriramulu Telugu University. He had his solo exhibitions 8 times at Hyderabad and once at the AIFACS Gallery, New Delhi. His works can be seen in many important museums in India and some abroad. He has stopped participating in competitive exhibitions since 1985. He has received the Sovietland Nehru Award in 1984 along with Pandit Birju Maharaj and Ustad Bismallah Khan, the National Award for Teachers, the CCRT National Award for Teachers, the Balabandhu Title from AP Balala Academy, the Pratibha Puraskar of the Telugu University, the Varada Venkataratnam Memorial Award of the Rajahmundry Chitrakala Niketan, the Andhrasri Award from Alluri Sitaramaraju Yuvajana Samithi, Rajahmundry, and several other awards from Slovenia, Hungary, Macedonia, Finland and USSR. Under his guidance, 16 students won the Sovietland Nehru Awards and visited USSR as Indian delegates, 20 children received the National Talent Search Scholarships in painting given by the CCRT, New Delhi, and many more have become world-renowned painters. Please contact the curator of the gallery at 2311-3709/98850-80296 for further details. Be the first to comment on Painting Exhibition by B A Reddy! Just use the simple form below. fullhyd.com has 700,000+ monthly visits. Tell Hyderabad what you feel about Painting Exhibition by B A Reddy!